How can I send notifications from PRTG to Twitter? The Twitter Custom Notification is not working anymore. I also noticed that PRTG dropped its own Twitter notification in the 8.1 release. What can I do to send notifications to Twitter? Twitter has changed its login procedure and no longer supports API calls. The login procedure is switched to oAuth where each tweet that gets posted requires user interaction, the user always has to enter a PIN code to allow an application to post a tweet. This of cause is not an option for an automatic notification. Registered applications however are allowed to post tweets without user interaction. PTF Tweet is such a registered application and is the successor of PTF Twitter. With PTF Tweet you can both post tweets as send direct messages. 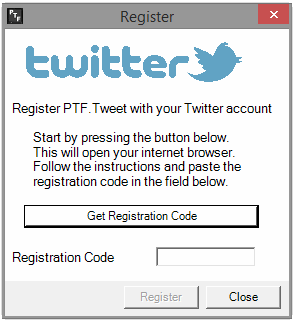 The only thing you need to do is register PTF Tweet with your Twitter account. This only needs to be done once by launching PTF Tweet with the -r switch from the Notifications/exe folder of your PRTG installation.